My mother has invited me to attend a Classical Pursuits course in Toronto this summer from July 12 through the 21st. 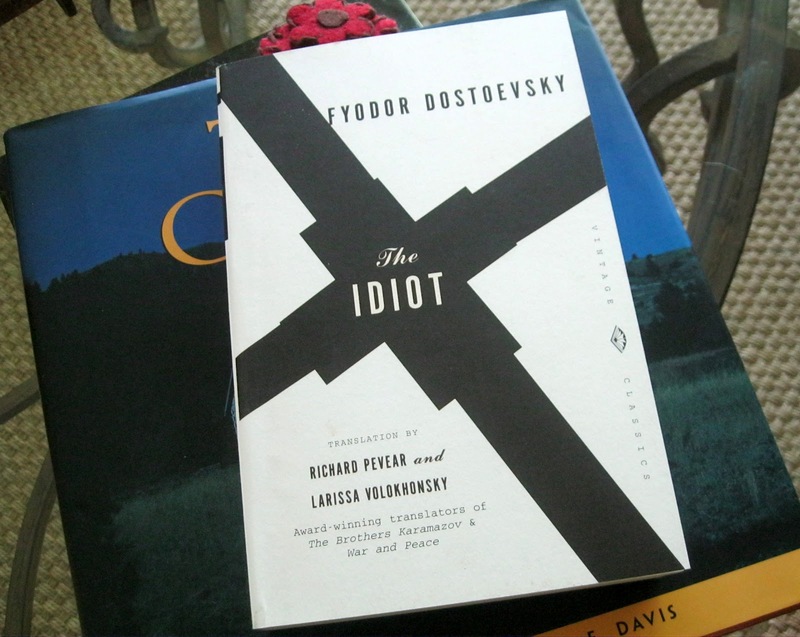 We’re reading Fyodor Dostoevsky’s The Idiot (which seems fitting given the teaching career I’ve held for the past 28 years). Anyway, the translation we’ll be discussing is the one by Pevear and Volokhonsky, and I’ll be posting on it probably more than once in July as it’s such an important novel. Dostoevsky’s intention was “to portray a truly beautiful soul.” What are the stakes of such a goal? How does Dostoevsky characterise Prince Myshikin? What is the relationship between the setting and the characters’ internal world? For what characters does the narrator have the most sympathy? The least? For whom do you feel the most sympathetic? The novel is filled with “scandalous scenes” and contrasts/clashes. What might their role be? Are you willing to read along? I’d love to hear your ideas on these toward the end of July! Previous Post Can an Introvert Put Social Buttons on Her Blog? Oh, how fun! I won't be able to read along because I'll be painting and moving, but I wish I could. I *heart* Toronto!!! I just love P&V's Russian translations, but know I can't join in for July. Hope you enjoy it. I'll look forward to your post! Oooh, tempting! I'm currently reading Elif Batuman's The Possessed about her journey through Russian literature (it's brilliant) and am planning to finally get to grips with War & Peace this summer. I've only read The Brothers Karamazov (which I read 3 times with varying levels of success) and Crime & Punishment (which I loved) and so would like to read more by Dostoevsky. I haven't tried any of P&V's translations so I'm curious. Moving?! That's so much fun; about like sticking forks in your eyeballs! I heart Toronto, too, and I pray it's cooler than stupid ol' Illinois in July. I want to know what colors you're painting, or is that in reference to the house you're leaving? The first Pevear and Volohonsky translation I read was War and Peace, then The Brothers Karamazov, both of which were wonderful. But, I think they did a deplorable job with…I think it was Madame Bovary? No, that can't be right as it's French…anyway, I hope to fully absorb The Idiot. I seem to specialize in that department. I love Dostoevsky, too. I've only read Crime and Punishment, and The Brothers Karamazov, so I'm looking forward to The Idiot. He explores the condition of being human so very well. It doesn't seem to be for everyone, but I surely love it…maybe you will, too, someday. Then again, maybe not! I know lots of people that can't bear it. Such as some of my closest friends! Their Dr. Zhivago translation got less than rave reviews… I've never been able to get through that book.